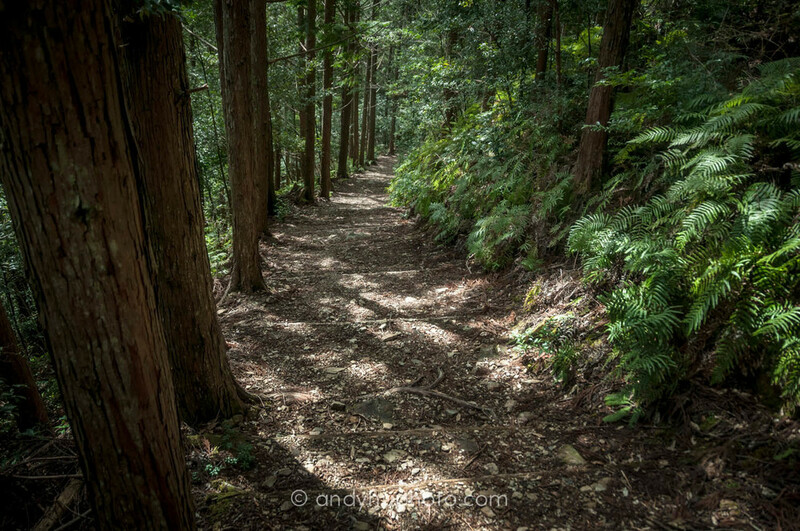 Why trek the Kumano Kodo? The Kumano Kodo (熊野古道) is a pilgrimage route used by Japanese buddhists for over 1,000 years in Kii, south of Osaka/Kyoto, and is one of the best trekking routes in Japan. A UNESCO World Heritage site, the Nakahechi trail (the main trail of the Kumano Kodo system) leads the trekker through dense forests and quiet mountain hamlets, passing dozens of small shrines and large temples such as the Kumano Nachi Taisha, famed for its tower and waterfall. This trail constantly pushes the trekker to confront his/her inner wilderness but also yearning for civilization. Highly accessible, the trail presents a wonderful opportunity to converse with the forest even for the moderately fit. The availability of ryokans (traditional Japanese guesthouse) at every stop along the route makes the journey extremely comfy and tasty. At the end of a hard day, soak in a hot tub before munching on delicious home cooking and passing out on a soft roll over spotless tatami floors. This is a 4-day point-to-point trek in Wakayama Prefecture (South of Osaka and Kyoto), Japan, covering ~86km. The trek requires moderate fitness level to complete, perfect for practicing heavy-gear trekking. The trail is incredibly accessible (all overnight stops and many major landmarks are accessible by car most of the year), making this route a choice road trip. I started in Tanabe and ended at the stunning Nachi Taisha shrine. Although not required, this can be easily modified for reverse or circuit route. The trek was completed from 03/10-13 in good weather and during offseason. This guide is written based on my personal experience completing this trek in one occasion. It is meant to provide the reader with an account of the trek from one trekker’s perspective. However circumstances may differ. Please use the information provided as that of a rough guide. Day 1: Tokyo (东京) - Kii-Tanabe (田辺), Shinkansen to local train 8-10hrs: if arriving by train, the easiest way to start is get to Shin-Osaka by Shinkansen, then take local train to Tanabe (2.5hrs), then take local bus next to Tanabe station to Takijiri-oji (40mins), the Nakahechi trail head. The closest airport is the Nanki-Shirahama airport, 50mins from Tanabe by local train. Day 2: Kii-Tanabe - Tajikiri-oji (滝尻王子)- Chikatsuyu (近露王子), local bus then trek 1hr: we took the bus next to the Tanabe train station to get to the trail head. Ask the bus driver to warn you at the Nakahechi trail head stop. There is a tourist information center and shop near the stop, where you can get free maps, buy stamp books to keep updated on your progress, and bells to warn off bears. We started the Nakahechi trail at 9:00, arrived in Chikatsuyu at 16:00. Given our trekking speed, we could have spent the night further down at Tsugizakura-oji, but be sure to check with lodgings for late check-in options, many have last check-in policies. Day 3: Chikatsuyu - Ukegawa (請川), trek: our easy day yesterday meant we had to make up for the lost distance today. Expecting a long day ahead, we started early at 8:00 and snaked up and down the mountain under cover of clouds. Our friend Ming decided to take the bus to Ukegawa and was able to sleep in, help ferry my 30lbs pack, and get to the final destination early for check-in. The sky cleared at around 10:00, giving the woods a golden glow. Around 15:00 we found ourselves lost on a highway. We have not seen any wooden trail markers for over 20mins, when we should be passing one every 5-10mins. We were no longer on the Nakahechi trail. The good news: roadsigns and google maps indicated our road leads to Hongu, our final destination for today. We followed it and found a way back on the trail at Hosshinmon-oji (発心門王子). This means we missed Inohana-oji (猪鼻王子) on the stamp book. There is a detour up near the final approach to Hongu offering a spectacular view of the giant tori gate at Hongu. Be sure to take those extra steps up! At around 17:45 we finally exited the mountain to a major stop on the route - the Kumano Hongu Taisha (熊野本宮大社), the temple was closing for the day as we arrived. To our dismay, our night's lodging is located in the town of Ukegawa, another 3km south of Hongu Taisha. We walked along the highway, the river to our left, and arrived at 18:30 to hot buckets of water for soaking our feet. Ukegawa is quite close to a few onsens - little pieces of heaven on earth that people describe as "Japanese hot springs". Yunomine Onsen and 2 others are 2-4km from Ukegawa and also offer (more expensive) lodging. Check on their websites beforehand to see availability and last check-in times. Day 4: Ukegawa - Koguchi (小口), trek: my friends left me in the morning, heading for Osaka and Kyoto. I started at 8:00 and took my time with the shortest day of the trip, an easy 13km to Koguchi. The sun was out. Puffs of clouds sailed through the sky. I lunched at the top of a hill with a view of the surrounding forests. After, I took a nap on a wooden bench under the sun. I arrived in Koguchi at 14:00 and decided to check availability at the first one I hit: Koguchi Shizen-no-le Lodge (小口自然の家). The lodge is deserted until 15:00, the check-in time. There are vending machines and a convenience store in town, but no ATMs or restaurants. Since I was alone and running out of cash, dinner at the lodge was not an option (2,000 yen), so I made do with cup ramen at the convenience store. The lodge has wonderful tatami rooms, a nice warm bath with a hot tub and showers, serves delicious dinner (I smelled it), and offers mediocre onigiri bento boxes for 560 yen. The rate (6,000 yen/pax) includes a delicious and very filling breakfast. Upon request, the guesthouse owner happily showed me the trailhead to Nachi (5min walking from the lodge). Day 5: Koguchi - Nachi (那智) - Kyoto (京都), trek, bus, then train: started at 8:00 for the most strenuous day of the trek. Today, I was to climb two mountains and cover some serious elevation. I first reached the Echizen-toge pass, then the Ishikura-toge pass. Note that the appearance of the trail markers changes halfway through this section! I finished most of the climbing at around 10:30. There are vending machines and restrooms at the forestry road junction, which is also a good place to get lost. 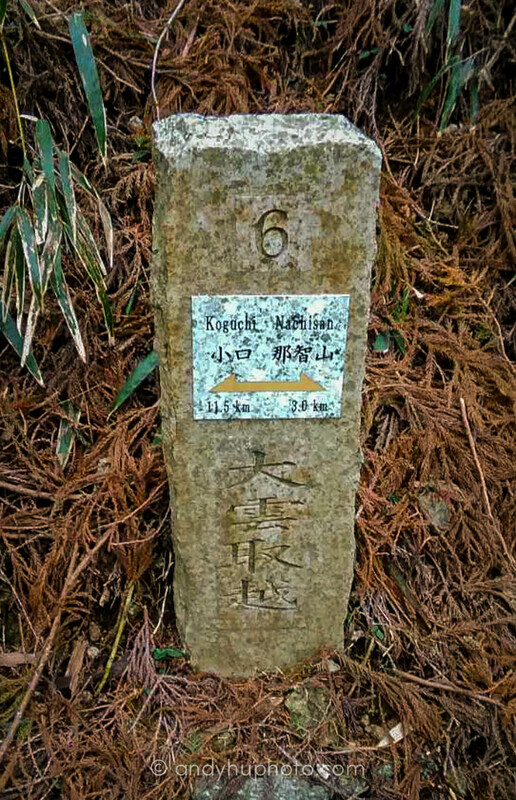 Be sure to get on the right track by finding the kumano kodo sign or direction towards Irokawatsuji. Finally, I passed the Funami-toge pass. After what seems to be a radar station, I re-entered the woods and saw a small wooden pavilion above to my left. I walked up the path to find the Pacific Ocean stretching into the horizon. After more than 3 days with nothing but trees, the vast expanse of the ocean hit me like a fist. No pictures here as I hate to spoil things for you, but don't miss this spot! I arrived at Nachi Kogen Park (那智高原公園) at ~ 16:30 and took the stairs down next to the parking lot, towards the grass to get back on the trail. It started raining softly. A bit more walking took me to Kumano Nachi Taisha (熊野那智大社), an enormous complex of old and new shrines. A few more steps down from Nachi Taisha is Hirou-jinja and the Nachi-no-Otaki (那智大滝) - a silver waterfall next to an ornate orange tower. This marks the end of the trek. Overnight options at Nachi are very limited. Snake down the paved road to a parking lot and bus station for service to Katsuura town and station, where you can find more options for accommodation as well as local train services to Shin-Osaka (which transfers to Kyoto, Tokyo, and other major cities). I took the last train from Kii-Katsuura to Kyoto, transferring at Shin-Osaka, arriving at ~23:00. Prepare cash: withdraw enough cash in Tanabe before heading out. There are limited ATMs along the route and many lodges do not take cash. If you're traveling alone, have 30,000-40,000 yen on you. If you are with companions, each person can bring 25,000 yen (based on shoulder season prices!) ** There is an ATM in Koguchi's post office that has worked on international cards before, but it's not open 24/7. Get to Tanabe: by train, take Shinkansen to Shin-Osaka then take local train to Tanabe (2.5hrs). By air, fly to Nanki-Shirahama airport, then take train to Tanabe (50mins). From Tanabe, take local bus in the square next to Tanabe station to Takijiri-oji (40mins), the Nakahechi trail head. Ask the driver to warn you at "Takijiri-oji" or "Nakahechi trail" or "Kumano Kodo"
If you have long roads to cover, hitchhiking is great in rural parts of Japan. As a non-Japanese, people are always ready to help you! If you speak Japanese, even better! The Kohechi trail is much more isolated than the Nakahechi trail! The lack of human presence combined with its reputation as the "most difficult" of the Kumano Kodo trails brings up its difficulty. Be very cautious on trail! Bring food and water! There are little to no shops along the Kohechi leg. Closest thing I got to a shop was a little hut with a few items/vegetables on the counter. You take what you need and leave the money in a box. Rain gear! Rain gear! Rain gear! When I went (Aug-Sept), it basically rained EVERY MUDDA SHIBAL DAY. Like literally, one of the days, the trail became a frickin’ river. I was trying to make my way down in mountain trudging through ankle high streams, rain pounding on my back, with all of my gear (at the top of the mountain there was ridiculous wind) also, a part of the trail was closed due to a land slide at the top of the mountain, so I had to take a detour around the side of the mountain. Frickin’ steep drops. (I’m scared of heights) I started to wonder if I died out there, who would find me. Recommend a hammock with a tarp over head. There really isn’t any space to pitch a full tent. But there are a lot of trees to put up a hammock. Best to camp at the foot of the mountains. It’s windy up there. And bears. When hiking to Omata village. If you were planning on spending the night in a ryokan there, don’t. Continue on trail. After a very steep climb, you will find a cabin half-way up. The cabin is open for use by hikers and is complete with supplies to build a fire, boil water, etc etc. (Of course, you need to bring your own food, sleeping gear etc etc) A really, really cool gem. Brings out your inner lumberjack. You won’t find it mentioned in any guidebook!! Special thanks to these folks. For accompanying me on this forest adventure and for helping flesh out this guide! Got a question? click here to ask me directly! Got it! I'll get back to ya ASAP. Hang in there.